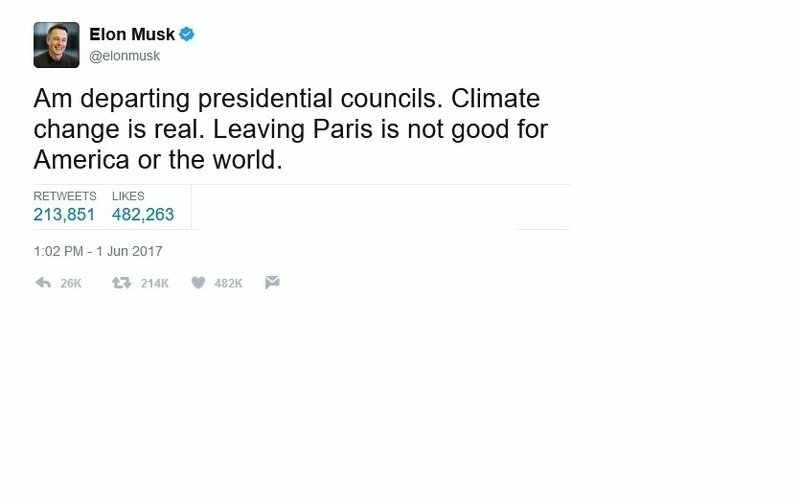 Originally drafted in December of 2015 and signed by the Obama administration, the Paris Agreement is a non-binding, voluntary international pledge to significantly reduce greenhouse gas emissions and lessen the affects of global warming. Nearly 200 signatories are included, and it’s considered by advocates as a major step forward in addressing climate change. All of the major greenhouse gas producers in the world are included in the agreement. The U.S., which emits roughly 15 percent of all CO2 emissions globally, committed to reduce emissions by as much as 28 percent by the year 2025. During his 2016 presidential bid, Trump made the Paris Deal a major part of his platform, promising to dismantle it shortly after taking office. This latest move adds credibility to the claim that he’s now fulfilling those promises. Trump gives a variety of justifications for pulling out, the biggest of which is the risk it poses to the U.S. economy and the American worker. 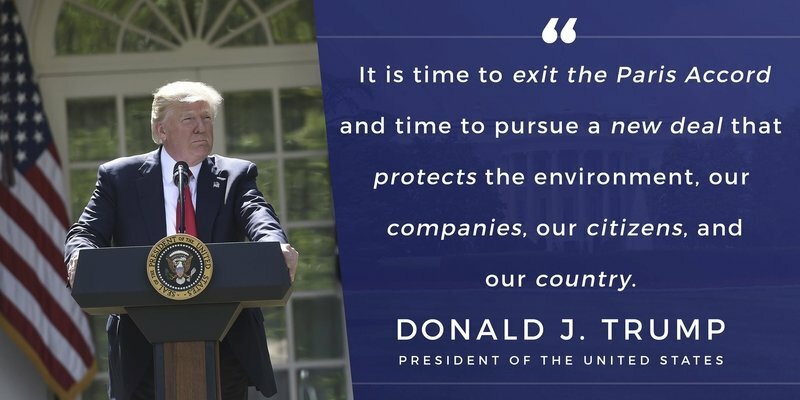 During his speech in the Rose Garden on Thursday, the President stated that the Paris Accord threatened to cut 2.7 million jobs by the year 2025, 440,000 of which would come from the manufacturing sector, including automotive. “This agreement is less about the climate and more about other countries gaining a financial advantage over the United States,” Trump stated. Other objections include Trump’s call to “unlock” domestic energy reserves, while potential future legal implications could punish the U.S. for not following through on its promises. While Trump has framed the withdrawal as a “reassertion of American sovereignty,” environmental advocates see it as a major blow in the ongoing efforts to curb GHG emissions and combat climate change. The pullout places the U.S. alongside Nicaragua and Syria as the only nations in the world not committed to the accord, and it creates a vacuum when it comes to international leadership on the issue. The pullout places the U.S. alongside Nicaragua and Syria as the only nations in the world not committed to the accord. Shell and Exxon have also voiced support for remaining in the deal, as has Ivanka Trump, senior adviser and daughter of the president. The announcement follows hot on the heels of a recent international trip where Trump met with several world leaders, many of which have reaffirmed their commitment to the deal. During his recent visit to the Vatican, the Pope gave Trump a signed copy of the 2015 encyclical letter that called for greater environmental protection, citing scientific evidence that climate change was caused by human activities. Thursday’s announcement essentially launches a drawn-out, four-year process to actually pull out from the Paris climate change deal indefinitely. November of 2020 is the zero hour for the official withdrawal, ensuring the Paris Accord as a major point of contention in the next presidential election cycle. Trump’s statements also appear to leave the door open for the U.S. to reenter the deal at a later time under new terms, with the President adamant that the U.S. will continue to strive for environmentally friendly policies, but not at the disadvantage of the U.S. economy or U.S. businesses. November of 2020 is the zero hour for the official withdrawal, ensuring the Paris Accord as a major point of contention in the next presidential election cycle. The big question is how the move will affect other countries still committed to the deal. With the U.S. out, a greater burden will be placed on other countries to reduce emissions even further, while simultaneously, there will be less pressure to actually make those goals, which could weaken the accord going forward. Critics contend China is now positioned to take the lead in terms of climate change. With the U.S. out, a greater burden will be placed on other countries to reduce emissions even further, while simultaneously, there will be less pressure to actually make those goals. When it comes to the energy industry, Trump is still championing coal. However, in the face of cheap renewables and growing public pressure for cleaner sources of energy, it remains to be seen how much of a comeback coal will make in the U.S. While dramatic, we’ll have to see how the withdrawal affects the auto industry. Local support for cutting emissions might still boost incentives for electric and hybrid vehicles, while automakers seem set on a more even-keeled approach to regulations and policies. We’ll follow the story as it develops.